LOOKING FOR A BUSY, HIGHLY VISIBLE COMMERCIAL LOCATION FOR YOUR BUSINESS? COME CHECK THIS PROPERTY OUT! LOCATED ON RT. 50/ GOVERNORS HWY. IN THE MIDDLE OF THE MONEE BUSINESS DISTRICT AND WITHIN CLOSE PROXIMITY TO INTERSTATE 57. THE ORIGINAL MAIN BUILDING HAS A 30X60 RECEPTION/ OFFICE SPACE WITH A BATHROOM. THE ADJOINING BUILDING IS 13 YEARS YOUNG WITH RADIANT FLOOR HEAT, 3 PHASE ELECTRIC, 3 -14FT OVERHEAD DOORS, 1- 8FT DOOR, TRIPLE BASIN FLOOR DRAIN, MORE ABOVE STORAGE, AND ANOTHER BATHROOM!!!! THEN THERE IS THE OTHER 30X48 OUT BUILDING WITH MORE STORAGE, A CEMENT FLOOR, AND ELECTRIC. DOUBLE LOT WITH PLENTY OF PARKING AND 160 FT. OF FRONTAGE ON RT. 50. BONUS ADDITIONAL DRIVE BEHIND THE BUILDINGS! PROPERTY HAS BEEN VERY WELL MAINTAINED AND IS NOW VACANT. PREVIOUSLY USED AS A CONSTRUCTION EQUIPMENT & TOOL RENTAL COMPANY. 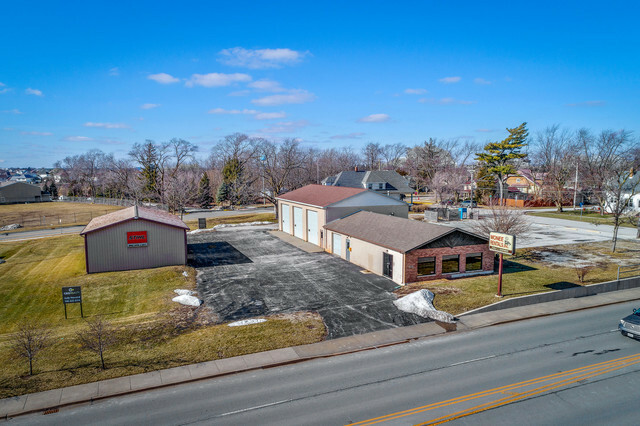 PERFECT SET UP FOR A VARIETY OF USES...BUSINESS, AUTO, LEASING EQUIPMENT, STORAGE RENTAL, MOTOYCYLE SHOP, MECHANIC SHOP, ETC. APPRAISED OVER $400,000!! PRICED TO MOVE.